Is the bottom behind us? I've been undecisive lately as it can be so, or at the same time, we may still see a full-on purge to the low 700s on ES. We have certainly seen some improvement, now let's have a look where it could lead. Note: there will be no report tomorrow, but i'll try and post a short update on market close. EURUSD: good recovery and resistance have been broken leading the way to 1.32 ... or even all the way to 1.37 ! Our MM stall level (~1.22) was not quite reached and our scenario is now updated to a possible return to 1.27 Obviously, we have conflicting pressure from deleveraging currently strengthening the US$ and the phenomenal amount of public debt which should weigh on the US$, so volatility is here to stay in the short term. ER: Testing 500 now. Is it going to break it...? Probably not, but who knows. Most would be long now (60mins chart) and would just tighten stops a bit just in case. It is so far only a retracement trade (contrarian) on the Daily chart. Again, on a middle term outlook, ER is likely to go lower at least once more. ES: Are we now going for the big "1000" battle? Possible... Again, one should only go with the flow. 967 is a MM stall level that was hit yesterday, so we'll watch that level again today. One could then either try and hit 1000 or just as well retrace back to 930s. Keep an eye on shorter time frames, and watch out for more volatility on GDP Q3 announcement tomorrow. Oh well, yes, i got it wrong yesterday. It does not happen too often, so i won't take it too badly. We had a support level around 843 on ES, and a pivot level around 875 and those levels were cleared marked on our charts. What happened was a sudden breakout effect to the next resistance level. This is nothing new and charts reacted very well. Regular readers now know that we always have to analyse those price jumps in the light of quantum dynamics, i.e. prices being attracted to predefined levels. Secondly, i repeat again that high volatility acts as a time compressor which requires looking at shorter time frames. This is also why i still publish daily updates on this blog dedicated to weekly market reports, and it is sometimes not even enough. EURUSD: We have a target around 1.27 to 1.274, and we have to see whether 1.27 will now act as a support to go higher. It is unlikely though. This bounce is likely purely technical. We keep our mid term objective in the 1.22 area, with continued volatility. A bottom may be near. ER: Nice rebound to Fib PR1. Obviously one would need to see 500 passed and even tested for support to see a change in trend. We may have a 2nd up day but no major reversal right now even if again volatility plays tricks on us. ES: Levels are even clearer here, with 930 being a strong resistance ahead. There could be some carry-through, either technically motivated, or from some start of herd effect, but we're not out of the woods yet, and there will be opportunities at cheaper prices still. I was bearish yesterday yet wanted to give current lows a chance to hold. That's what happened for a while with the confirmation of the 875-894 resistance area, to then see the negative tone resuming strongly, to the point that whether one wants or not, the market is VERY likely to go lower still... Maybe another 15% drop by year end (!) The good thing is that it would be at last the absolute bottom we are waiting for. We however have Q3 GDP and a few other economic indicators coming so again we can't discard a minuscule chance of the bloodshed stopping soon. ER: we're confronted to the same support level (~438-443) and again little chance it will hold. Difficult to say whether it will be a up day or a down day in the very short term, but NO significant bounce potential over a couple of days. We still aim at ~380 over the medium term. EURUSD: still aiming at 1.22. 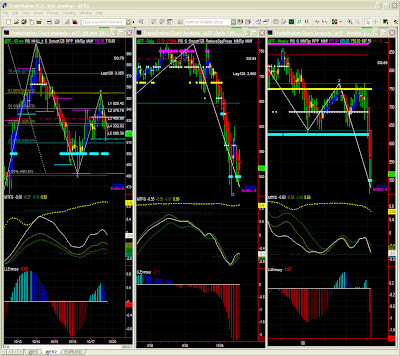 Short term, MM stall level is 1.2329. Last week's upper bias quickly evaporated, but we followed it day by day so didn't fall for it. This report is short: all markets are tuned the same way. Please also read the ER report below. Lows will be tested and then... lower again probably. There is some support level around there (~843), but buyers are certainly not coming back just yet. MM levels give us a support level below 820, and then... is there an end to it...? oh well, should i repeat myself... if current lows fail to hold, support is probably to be found somewhat lower... the markets could slide to the low 700s... I shall update targets during the course of the week. Let's give current lows a chance still..
Fib and MM converge to the low 700s, and we'll see whether there is a slight chance of a support level along the way. Please check daily updates this week. 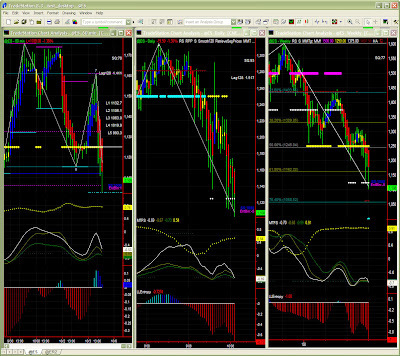 Dominant TF: Daily, 60mins with the weekly chart obviously a little lost in this environment. More worrying maybe is to see 500 barely holding on a string, as we know that volatility has the annoying effect of stretching support levels without breaking sometimes. Hence while we penetrated it quite deep (to below 440 correctly anticipated during the course of the week), there is still a bounce potential. Do we really believe it will? I'm afraid not. Current deleveraging on many many many billion US$ worth of positions is a very very very painful adjustments. I would recommend to sit tight for now. We may however have a much better looking 2009 ahead of us. EURUSD: When 1.36 broke, we knew it had to go further south and while current levels offer modest support, we will probably hit ~1.22 later on this coming week. We have an extraordinarily strong tension to release offering an amazing bounce potential but it's just not there yet. 1.22 is a MM stall level, so could be the ideal point for it. One must however always be wary of any "reading between the bars". In the short term, 1.255 could hold for a while. Drifting should continue, probably towards friday's lows. The market resisted to the bout of panic selling on the futures markets prior to the open on friday, and this may indicate a bottom for many market participants. I should still remain cautiously short and check lower time frames where we have a target in the low 450s. ER Weekly: again this has been a market crash. Significance level is lower so we will not pay too much attention to MTFS and Entropy. Going down anyway... We'll therefore only look at MM and Fib levels and we certainly have convergence in the low 400s... I hesitate again about the 500 level which could be stretched to the limit and still be valid. 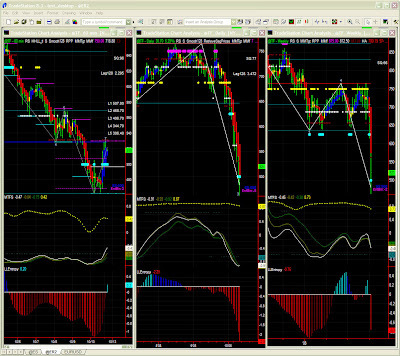 Again, we'll have to keep this time frame as background info and follow the 60mins charts rather. Let's tighten our seatbelts... but shall we soon hear the "Brace" command now...? Crazy volatility... Daily reports prioir to this crisis used to be good enough as the techniques generally gives a market outlook about 3 to 5 bars ahead. Nowadays, one would need at least 1 or 2 intraday updates to keep up with this market chaotic behaviour. EURUSD: as mentioned yesterday, despite being on a target level, there is indication of the US$ strengthening for technical reasons (deleveraging). Next target is just below 1.27 and will be hit sooner or later. ES: As said above, we had the anticipated bounce and then down and up... and down again. If a support is not found just below 870, we could see ES fall to below 840! Conclusion: Let's forget any recovery potential for now. The 1000 battle on ES is now a stuggle to stay above 875. And more hardship to expect if these low levels do not hold today... Again, i recommend long term investors to stay out of it, or cash in on volatility with WOTM options (WAY Out of The Money). 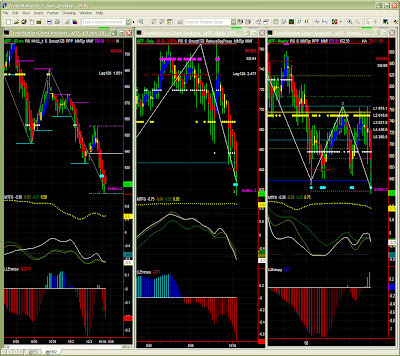 Trading short intraday time frames is still possible if not easy (10mins max). Oh well, another pullback... at least direction should not have surprised any of us. We're still in "hangover mode" and this situation is severe enough to keep markets tumultuous for a while. To the critical ones who will say i've been too shy or conservative, i will reply that again volatility is a form of time compression and as such there is so much one can publish on a daily report. For intraday updates, market commentaries are also available (restricted access). EURUSD: yesterday, i gave a warning that stops should be tightened as as we now hitting a target. We have no indication of a recovery today either. Over the longer term, the US$ could strengthen further because of continued deleveraging of many many funds. ER: I thought the drop would stop short of 500, but it somehow had to be penetrated, without breaking though. ER should remain in low levels, yet with the assistance of this sky-high volatility, a bounce to 530 is also possible. Intraday play is recommended, so is staying on the sideline for longer term investors. Despite difficulties in capturing volatility, we still believe we need at least a few more weeks to dissipate negative pressure, and we are still waiting for the "1000" battle on ES to unleash some substantial buying. There is a LOT of cash on the sideline right now... A LOT !!! Gathering strength... or is it just a retreat...? Yesterday, i anticipated there wouldn't be much room upward and that the market had to pull back a little to "prepare for battle" particularly 1000 on ES. The retracement occurred stronger than i anticipated, but can we really be surprised still in this high volatility environment. At least the retracement is now engaged and we just have to gauge where support will be found. EURUSD: I had that Fib/MM target, but admittedly did not dare publishing it. It is a Fib target on the Daily chart (1.272), it is a MM level (1.281) on many time frames, but here again, volatility really took us all by surprise. At this point though, stops must be tightened. No reversal at this early stage, but the drop can be stopped near this low level. ER: drifting should continue, but this is only congestion at a higher level even if one can see wild swings in an intraday basis. ER could retrace to below 520 (511?) but this is not a return to bear mode yet. We're only gathering strength for now... Will that be enough? We'll know soon enough. EURUSD: as said before, we've left the [1.354 -1.3672] range to settle lower and [1.33-1.3328] is where it could happen. No recovery potential here for the time being though. We have to wait for the current drifting down to stop first. ER: Could reach 560, but indicators are not very convincing. We don't see any reason to rush into the market using long term scenarios. 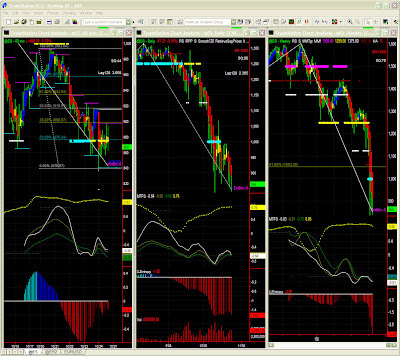 It is probably easier to swing trade using shorter intraday time frames, or wait a little using daily/weekly charts. ES: We can see a bit of angst ahead of the 1000 key level, but current resistance level inches away from the much anticipated 1000 is also a strong technical level on short tick/volume charts, where action actually is. For now bounce level can be 984, or 8 or 16 points lower. 969 is now a very strong support level and it is clear ES needs a stronger base to prepare for the "final batte" ... :) It is only when 1000 is attacked that we will see more energy being released in the market. 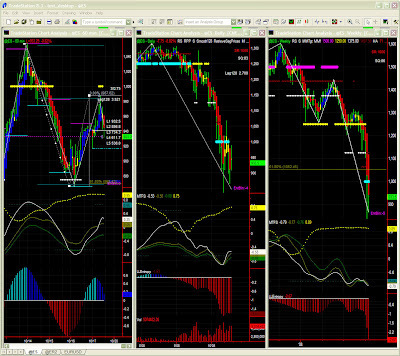 Watching short time frames is again most recommended. Last week's comment that we would see congestion (yet with high vol) until we pass 1000 again was valid and still is. Like with ER, we certainly have an upper bias now which we must observe with a lot of caution. ES has difficulties reaching overbought levels but should try and creep to 1000 indeed. Volatility is still high so i venture seeing the target onthe 60mins chart, but it could a little longer of course. If such attempt fails, we will look at 925 holding for a another round of buying then. Yes, the situation is SO similar that i could almost repeat the same analysis. It is difficult to gauge how long the hangover period will last now, but 1000 is undoubtedly THE test level going forward, and at the same time, we'll watch carefully a possible support level (925) if the recovery fails (likely scenario) and if ES is then range bound for a while. Last week's report (monday pre-market) indicated we should not give up too quickly as the 500 level was bending but still holding in the storm. The next comment about a "hangover" period is still valid this week even if we are slightly more positive this week. Does that mean volatility will come down now ? maybe, maybe not... Going long on short times frames is possible, but conservative investors/traders may want to wait a little. EURUSD: we may have found a bottom, we have no clear indication of a strong recovery just yet so a congestion (with a lower bias) is likely for now until we get a strong signal. We'll therefore watch Fib levels on the 60mins chart, but on the daily chart, the test level remains 1.3672 which could be the signal we are waiting for. The crisis may be over, futures positions have been squared off on friday, Q3 corporate earnings haven't been too bad, so we're now ready to look a long entry point. However, we are still in a "hangover" period and volatility will stay strong for a while. 60mins may be a little too slow to take advantage of intraday play. We'll try and use this time frame to determine a entry point. We can try and find a better price, we can set our stops below 500, so now it's up to everyone to decide when to jump in. I here more or less repeat the above. We have some uncertainty showing in our indicators, with our MTFS rather typical of a failed recovery and Entropy showing a bottom but no strength yet. The 500 level could well be tested again even if we are now more positive. Prices are so low that one can always enter small on a shorter time frame and accumulate later on when confirmation comes at this time frame. A CAUTIOUS APPROACH IS STILL VERY MUCH REQUIRED. ER Weekly: again this has been a market crash, and this time frame is obviously completely out of synch. With derivatives expiring today, lots of positions are being squared, cutting losses, rolling over contracts etc... this is routine circuitry in the markets, almost independent of on-going dynamics. We however have some new information coming from lower time frames even if the longer term outlook is about the same. I remind readers that this public blog is reserved to mid to long term scenarios (i.e. few days to few weeks). I do also provide "trader's notes" several times a day to a selected few intraday traders. Yesterday, the message was, based on Wed's closing prices, that the fall could halt on current levels, or last Friday's lows or ... about 20% lower. Some are confused by such comment, but a support level remains a support level until broken! Short time frames gave a bounce potential on stall level indicating a short term reversal was possible. This however does not mean the overall trend has changed. I'll therefore stick to a mid to long outlook commentary with some short term info to adjust your current positions. EURUSD: Some congestion with a confirmation that the 1.343 level should hold now, so a slight upward bias is there. This is still not the 'spark' we are still waiting for. In fact EURUSD must crawl back to 1.364 before we see significant energy coming back. ER: Taking above comments in consideration, it seems 500 was indeed the key level for now. ER is now looking slightly better, but should stay volatile at least until middle of next week. For now, still no Long signal on the daily chart. ES: Same story here, except that the 60 mins chart is particularly easy to follow hence one may be even more tempted to trade short time frames. On a longer term outlook, we see 875 holding the way as the 500 level for ER, so despite no strong recovery potential just yet we may see a continuation of the hangover period for a while. The important levels will be 1000 for ES, and 625 for ER, not only passed but also tested for support. I wouldn't venture telling when this could happen... it can take 2 days to 2 weeks! Mid next week...? Oops... What did i say yesterday about adrenaline levels... Yes i warned of some drifting down back to 900 for ES and 500 for ER and yes... i admit i again did not anticipate this would happen in a single day. Volatility is out of this world (check VIX) and while we can still model directions and levels, we have a lot of trouble gauging market acceleration correctly. Now what's in store for today? About EURUSD, the US$ is incredibly resilient at these levels and could start strong again today. That spark is not coming so we'll stay oversold to maybe around 1.327. Going short is now however limited to short time frames. ER: Oh well, we're back to 500, and we could test lows again. We're obviously not too positive so caution is essential here. Another free fall remains possible with a target as low as 370 if the market doesn't calm down soon. At last, markets are calming down and behaving as anticipated. We've seen ES looking for support on 1000 and ER retracing also to Fib level 1 around high 540s. On EURUSD, we have a key 1.3672 level which proves difficult to pass so we may see more uncertainty around current levels (i.e. hovering between Fib 1.358 and MM 1.3672 levels). As said before, EURUSD needs a "trigger" to bounce off these lows, so may test the higher range boundary until it breaks out. 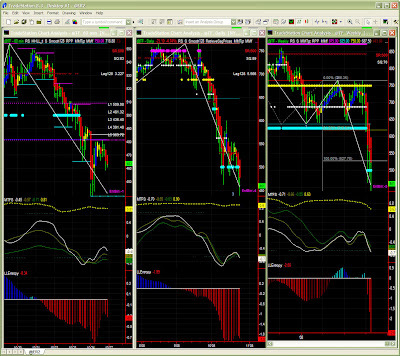 Check lower time frames for a better picture (we use a 233T, 610T, 1597T set of charts). ER: can go either way today, but drifting a little lower is likely. On the daily chart, it is obvious that we need to test a stronger level to go higher. We'll watch Fib/MM as in the last resort, ER could need to test as low as 500 to gather more energy. ES: same story here, ES will probably not hold 1000 and look for a stronger support level while staying above 900. So, no rejoicing just yet, the worst may be over, but buyers must remain quite selective and look for a better entry point, not so much for the long term, but after losing so much market cap since Aug, one may want to look for bargains a few % lower than current prices. We'll give a chance while staying very cautious. More than ever before, short time frames are recommended as they do respond better to shocks, spikes, or high frequency dynamics in general. In the meantime, we may see the "hangover" mode for a while until confidence returns to the markets. Staying above 875, and then 925 would be good enough for now before attacking 1000 (Fib level). EURUSD: US$ may strengthen a little more, but a congestion is more likely in the short term. Technically EURUSD is ready to shoot up but again, the spark is not there yet. ER: Same trouble... I would hate to believe we're aiming at 438. Let's give a bounce at current lows a chance. We must be very careful that in times of EXTREME volatility, support levels can be penetrated deep without breaking. A bounce would validate the supposedly strong levels given yesterday. At least the business of printing money is booming... Anyway, no sarcasm and let's just focus on our charts with a caveat first: A support level is a support level, or until it's broken, it's not broken... May sound silly, but many traders read too much in charts, and tend to project their fears on the market. Let's just try and be rational. Again, we'll leave the more fundamental analysis for later. ER: The 531 level given 2 days ago is more than valid still even if one should not overlook the enormous downward pressure that is still present in the background. While we can a lot of fun in short time frames, short sellers could maybe tighten their stops a bit. No rush to go long on hourly charts and above. ES: The equivalent level on ES was just below 970 (see previous posts) and is also holding for now. However, only a clear passing of 1000, then firmly tested for support could announce the end of trouble, and that's certainly not visible yet. The dynamics are otherwise very very similar to ER's. Should sellers wish to give a last bout before the weekend, we'll look for a bottom in the 500s for ER and 930s for ES. We'll also check for volume to make sure this bear trend is fully exhausted. "The end of the world as we know it..."
Again volatility is playing tricks and it is difficult to pinpoint market celerity accurately, or i have maybe neglected that part of analysis until now. I said yesterday that the €/$ would stay above 1.355 and that we should play ER and ES from the top of the intraday wave down and down... That's exactly what happened. Technically EURUSD is still looking for support in the 1.354 - 1.367 area and this explains the uncertainty in this range. ER: Heading straight for 531. We've discussed price segments in many previous posts and we all know markets move in fairly well defined discrete steps. Our problem is the energy carried in the movement. Again, this situation will take a LOOOOONG time to heal. if 531 doesn't hold, the market will try a round number, i.e. 500, but we can't discard a final bottom to be found in that area. Time-wise, it is very difficult to say when this could happen, but wouldn't be surprised if that is before the end of this week. PRE-MARKET UPDATE: we've had a bounce on ES at 963 i.e. a few points below the 1st "31-point segment" at 968. Oh well, didn't i say yesterday it could only go down... On ER i dared mention a possible target of 577 without thinking it would be reached so quickly. On ES i gave a target of 1065 which was reached in the 1st hour of trading ! Defeats the point of a so called weekly report, doesn't it? Remember: Volatility is a form of time compression in itself. So what's in store for today, considering the above. EURUSD: same down channel for now, yet levels haven't yet changed. In the short term, €/$ should try and stay above 1.355 but there is still a long way to go to break the channel upward and there may be a few interest rate cuts here and there to shake the system a bit. Sticking to short time frames is therefore most recommended. ER: is the worst over? maybe, but again we have to go through a 2nd hangover period and no substantial recovery in sight. We need a sort of double bottom of cup & handle to confirm yesterday's lows as a support level. Short intra-day time frames should be good fun though. If anything, pick the top of this wave and sell short again in the dominant trend. Staying on the side line until volatility subsides is also fine. ES: Same situation. Yesterday ES fall stalled... on MM stall level, so it's good to see indicators still responding fine in this mayhem. Now, same diagnostic with a similar need for a confirmation of a bottom. Market Direction(daily): short or preferably flat. Following intraday time frames is most recommended, but staying on the side line is fine too. Daily: where is this going to end? In this high volatility bearish market, we try and pick our targets and it seems we have a good consensus around 1065 - 1070 (MM - Fib) All indicators are pointing down but we'll keep a close eye at our target range now. Negative bias here too of course and a high probability that the market needs to test a bottom quickly. 1000 is now in sight but we have a convergence of targets around 1060 here too which we will have to hit to exhaust sellers, hopefully for good... As said before, the hangover may last quite a while, so i see no rush to really go on a "shopping spree" after the market has settled. Market Direction(daily): short of course, but staying cautiously away isn't a bad idea either. Options (RUT): better wait for the end of the storm here too. Last week monday, i warned again that we couldnt see the end of it, and i have to say the bottom is still to be found even if it may at last occur this week now that the bailout plan has been approved. Certainly not visible yet, but chances are that prices would settle soon. A number of banks and financial institutions are now ready to go shopping for bargains. EURUSD: crazy week for €/$, which we followed fairly accurately on shorter time frames. Yet, volatility still surprised us with targets hit much quicker than anticipated. The 1.3672 level was broken in short time frames indicating a possible target on 1.3521. We'll be QUITE careful though as the € could also bounce strongly. It certainly looks possible on longer time frames. Where and when is this fall going to stop ?? 625 looked like a very reasonable support level and breaking it now opens the way for a seriously bearish market. Are we really now targeting 577 ? Only a quick bounce early in the day would keep the 625 level valid. While 625 is not "officially" broken, it is not looking good. We'll give it another chance this week still, as the market could digest the bailout and volatility settle a bit. This headache must stop first. At least EURUSD is going exactly where anticipated. It reached our 1.381 target and could find a support at this level. We can't however dismiss the possibility of testing 1.36720. ER: Aiming at 625 although it could bounce on stall level here around 640. Down pressure is certainly too strong to expect any recovery soon, unless of course another exogenous shock abruptly changes dynamics. ES: Trying desperatly to find some support around 1125, the market would otherwise shed more... In case of breakout, target would be 1072. Conclusion: again & again, same as previous days i.e. have fun on short intraday time frames or go enjoy indian summer. No rush to get back into the market. Markets are still in 'hangover mode' with a US$ strenghtening. The target range given yesterday [1.381-1.384] is still valid. There is some support on 1.391 in the short term, but the € could even hit 1.3672 within a week. ER: You will notice i was spot on yesterday. Slight upper bias could take ER unconvincingly a little higher, even to pivot level in in 680s. This does not mean in the least a recovery and the same congestion/volatility yo-yo situation is still in place. ES: Retraced quite a bit in pre-market but ended around the 1165 area again. If passed, ES should normally test low 1180s. However there is still little energy in the market and any adverse news can stall this upper bias. Conclusion: same as previous days i.e. have fun on short intraday time frames or go enjoy indian summer. No rush to get back into the market. It will still be there where you're back from holiday.